Does Snail Mail Have A Place? Is there still a place for Snail Mail? The folks at CNN would have you believe that the tactile and personal nature of a handwritten letter will always have more of an emotional connection than its digital alternative. They may be on to something, but the reality is that the volume of posted mail has declined dramatically and continues to do so. In Singapore the postal service has just stopped delivering in the weekends citing plummeting volumes of mail and this pattern is a global one. In the States there are 10 billion less letters sent than there were 20 years ago - that's a lot of paper and stamp revenue. Physically writng a letter does provide more time for thought and it is true that email can be somewhat impersonal; the emotion in a handwritten letter is often easier to decipher. There is also the vicarious thrill of opening the condo mail box to see if the postman has "left something". More often than not the contents of the box reveal printed advertising circulars and even the power bills are now easier accessed and actioned online. Then of course there is the mail that belongs to someone who occupied you apartment a millennium ago and has not notified the sender of their change of address. At least with email you know that someone received it and opened it. In a recent survey I conducted in East Asia the results confirmed that most respondents chose email as their first choice for receiving our communications. There remains a nostalgia for the personally written word and a physical letter is a memento that has been touched by the hand that sent it. An email seems somewhat transitory by comparison. The premise of this broadcast is that governments and companies want to control the Net. "Harvard's Professor Jonathan Zittrain wonders if the original ethos of the worldwide web is under threat." Listen to this excellent podcast as these trends will have a profound effect on the future of the Internet and the Web in particular. "I love the companies that have created a position called “Head of Social Media” or similar"
Antonio Batanero, Sr Director Distribution & Digital Marketing, Sol Meliá - The Americas. In this interview with Ritesh Gupta, Batareno states that the establishment of a corporate social media committee might be the best way to release its full potential. If as he suggests we view social media as a mix between "word of mouth, customer satisfaction, email marketing, CRM, and loyalty" then it is really no surprise that the responsibility for this important marketing tool is often poorly defined within an enterprise. This is precisely why building, maintaining and monitoring online reputation are such important strategies and the corporate structure for managing this needs to be clearly thought through. Friends telling friends reveals the good, the bad and the downright ugly about an enterprise. BP who are currently battling with a growing ecological disaster are using social media as a key part of its PR strategy. In this way they can counteract some of the negative and satirical PR that is being generated on the Net. They are using the hashtag #oilspill on Twitter and judging from current trend mapping they seem to be maintaining the highest profile in the area most affected. 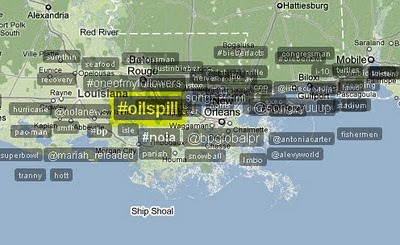 I suspect that there is a 'corporate committee' handling this and all of the emergency PR associated with the oil spill. So Who Will Dethrone Facebook? Who are the pretenders to the Facebook throne? It seems a strange question to ask when Facebook is at the top of its game, but the same used to be said for MySpace and look where it is heading. As this chart shows, Mr Murdoch's investment is still on the slippery slope to social oblivion. Ning is one of the more popular alternative platforms but even it has struggled to be a commercial success and has from July will embrace a different business model; the free version disappearing in a puff of smoke. So who might take over? Here are some of the platforms that are being touted by the pundits. OneSocialWeb has the backing of Vodaphone and their vision is a series of interconnected platforms thereby creating a bigger social web. The Appleseed project aimes to " create an open source, fully distributed and decentralized social networking software"
And then of course there is the next Big Thing from Google............? By now the world needs little convincing about the power and impact of social media. First released in 2009 this video has had over 2 million views and Socialnomics have just updated it. "What the Net seems to be doing is chipping away my capacity for concentration and contemplation. My mind now expects to take in information the way the Net distributes it: in a swiftly moving stream of particles. Once I was a scuba diver in the sea of words. Now I zip along the surface like a guy on a Jet Ski. " So says Nicholas Carr in his excellent article, "Is Google making Us Stupid?". AJ Jacobs took this further when he attempted to do something about his addiction to multi tasking. His belief (and something that I support) is that our digital world can over stimulate and make it difficult to focus; a none too happy situation as creativiity is the lynch pin of business success. So should corporate enterprises be worried? The cognitive consequences of the internet are profound and may well be affecting your bottom line. Enterprises and the world need problem solvers who can spend quality time analysing and coming up with creative solutions. The Net also tranforms culture and communications. Social skills and face to face communications are learnt attributes. Linus of Peanuts fame used a security blanket but this has been replaced in the modern generation by the iPhone and Messenger. I have noted in Singapore that there is a tendency to to shy away from direct engagement with strangers and to retreat behind a mobile screen and a set of headphones. The trick is to strike a balance between our online and off line activities. There are those who say that we will be smarter within the next decade as a result of the Net. Maybe so, but if we have lost the abilitiy to communicate effectively then this will count for nought.